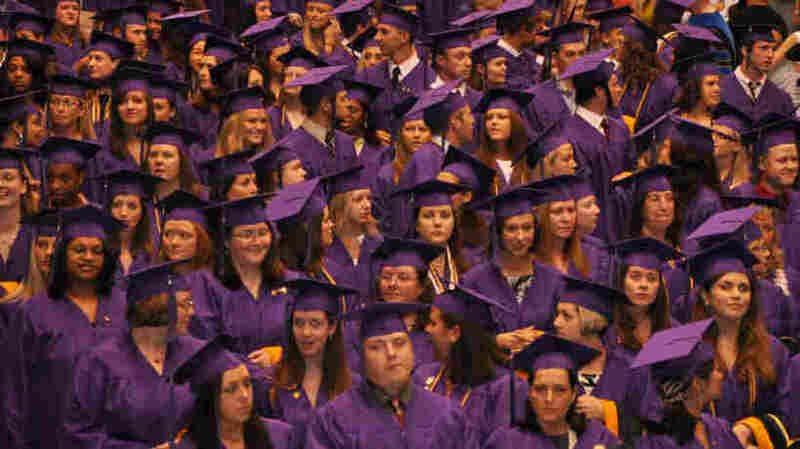 The 10 Things You Won't Hear At Commencement Charles Wheelan is sick of typical graduation speeches. When he spoke at his alma mater, Dartmouth College, he delivered what he called an "anti-commencement" speech. He packed it with straightforward advice that he wishes someone had given him at graduation, such as "Don't try to be great." 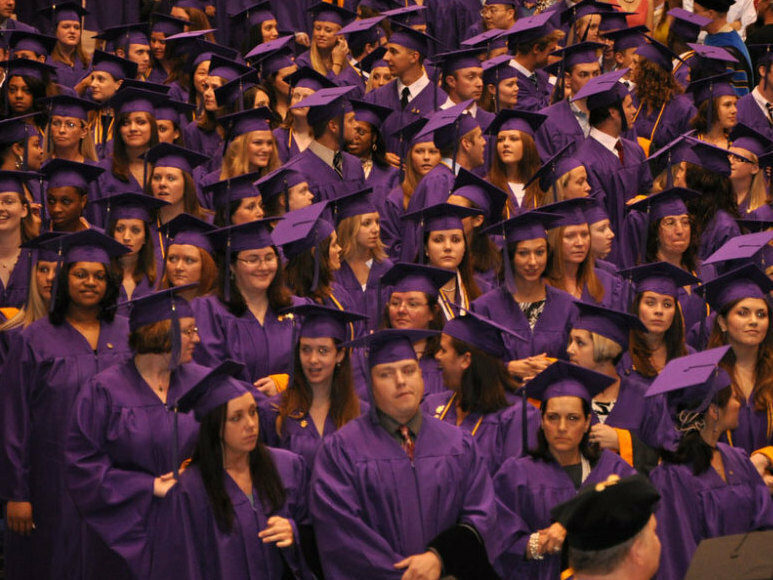 Elmira College graduates gather at their 2010 commencement. Every spring, new graduates sit through commencement addresses full of advice to seize the day, dream big and make the world a better place. Charles Wheelan says he's sick of those speeches. When he spoke at his alma mater, Dartmouth College, he delivered what he called an "anti-commencement" speech, with straightforward advice that he wishes someone had told him at graduation. He lists 10 of those pieces of advice in an essay that ran in the Wall Street Journal, including "Some of your worst days lie ahead" and "Don't try to be great." Wheelan joins NPR's Jennifer Ludden to talk about the 10 things your commencement speaker won't tell you. On his first piece of advice: Your time in fraternity basements was well spent. "It's meant to be more broad than just fraternity basements. It's playing Frisbee; it's playing with friends, hanging out where you're not doing work that you could be doing, because ... we have research now on what makes people happy, what gives us a sense of well-being. And the thing that comes up all the time is our connection with other human beings. 3. Don't make the world worse. 7. Your parents don't want what is best for you. 8. Don't model your life after a circus animal. 9. It's all borrowed time. 10. Don't try to be great. "I took 35 classes in college. Many of them were terrific, but some of them I can't remember at all, let alone specific assignments. But the people, of course, are the things that shape your life." On his second piece of advice: Some of your worst days lie ahead. "The traditional commencement advice is to come in and say, look, it's all going to be rosy, and you're going to change the world, and here's the path that will take you there. And I think everybody knows in the back of their minds — and certainly anybody over the age of 25 knows for sure — that there are going to be some rough patches. "So the story I told was the story of my roommate, and he is a terrific guy, very bright, but he desperately wanted to be a Wall Street banker. He interviewed all senior year, didn't get a job. ... We graduated. He didn't get a job all summer. By the following fall, he was living with his mother in San Francisco — still no job. And I happened to travel through. I was headed west on a trip around the world. And he had one job offer at that point. "And that was as assistant food and beverage manager at a hotel on the island of Saipan. ... I said, you know, take it, see what happens. I wasn't the only one. "What turned out to happen is that he went to Saipan — which is an island, by the way, that's 2 miles by 5 in the middle of the Pacific. He met his wife, who was from New Zealand, happened to be there. And then he got into the hospitality industry, went on to become CEO of Rosewood Hotels. So I think when students hear that, hey, just because I don't happen to have the best job at the moment, it's reassuring in an odd kind of way." On his final guidance to graduates: Don't try to be great. "You might end up being great, but so many of those things are beyond your control. And if, from day one, you're putting pressure on yourself to be in the NBA or win a Pulitzer Prize, it might actually lead you to make some decisions that are too risk averse or not to do some things that will lead in better directions in the long run."